Latin American Comparisons. Comparisons of Purchasing Power and Real Income in Latin America: A Review of Methods (J. Salazar-Carrillo). Comparisons of Purchasing Power and Real Income in Latin America: Empirical Results (J. Salazar-Carrillo). Real Product and Price Comparisons in Central American Countries: 1987 (J. Salazar-Carrillo and I.T. de Alonso). Indirect Taxation, Tariff Protection and Price Relatives in the Central American Common Market (J. Salazar-Carrillo). Theory. A Generalized Konus System of Index Numbers for Multilateral Comparisons (D.S. Prasada Rao and J. Salazar-Carrillo). A System of Log-Change Index Numbers for Multilaterial Comparisons (D.S. Prasada Rao). A Theoretical and Empirical Analysis of Index Number Formulae for Multinational Purchasing Power and Product Comparisons (F. Orlando). Methodological Issues. Extrapolations of Purchasing Power Parities (A. Arellano). The Use of Regression Methods in International Comparisons (J. Salazar-Carrillo). International Comparisons on the Basis of Different Types of Prices (J. Salazar-Carrillo). Sectoral Comparisons. The International Comparisons of Output and Productivity (ICOP) Project: A Progress Report (A. Maddison). Comparing Real Output, Purchasing Power and Labour Productivity: A Case Study for Argentina and the United States, 1973-1985 (D. Pilat and A. Hofman). Agricultural Output and Productivity of Labour and Land in Latin America (D.S. Prasada Rao and W.F. Shepherd). A Methodology for Collecting Construction Prices (A.J. de Souza and C. Michalka). Methodology for Comparing Rents (R. Lira). Index. 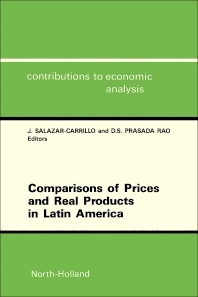 Contained in this book are studies related to the computation of purchasing power parities for comparing real income and product among Latin American countries. The principal components of income and product comparisons are discussed: from designing and executing benchmark studies, to extrapolating results for non-benchmark years. Different comparative methods and measurement techniques, including index number formulations, are considered. Comparisons of Latin countries with other countries are also undertaken. This volume aims to illuminate the thorny theoretical and methodological issues involved in regional comparisons, and to facilitate the practical application of the comparative approach to the many sided policy problems generated by a rapidly integrating international economy.